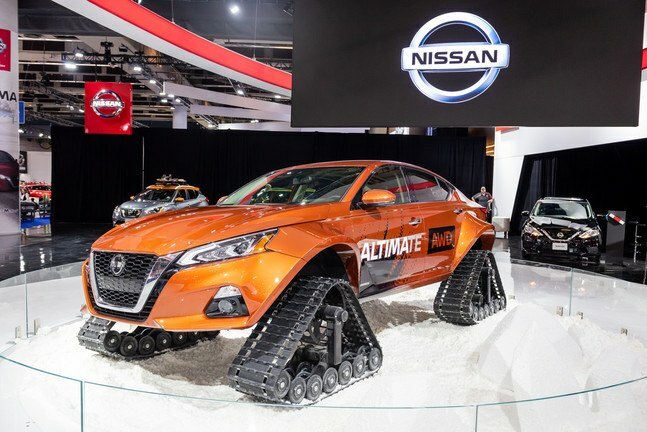 Nissan has just recently introduced one of its latest one-off vehicles – the Altima-te AWD! This massive promotional sedan is based on Nissan’s all new 2019 Altima! The Altima-te AWD was modified by Motorsports in Action with heavy-duty 180-Millimetre Wide Front and Rear Fender Flares! Plus, the suspension components were raised by 50 millimetres! Incredibly, brakes are 100% original – and only the geometry has been adapted – using custom parts. Motorsports in Action is based in Quebec, and also races McLarens in IMSA Michelin Pilot Challenge. In addition, the production version of the 2019 Nissan Altima is also unlike any other Nissan sedan. The 2019 Altima is the first sedan in North America to offer Intelligent All-Wheel Drive! Even better is that Intelligent All-Wheel-Drive comes standard on all 2019 Altima Canadian trim levels! The 2019 Altima comes available in four trim levels – S, SV, Platinum, and Edition ONE. The Edition ONE will only be available for a limited time period, based on the Platinum Trim. If you are interested in getting to know the all-new 2019 Nissan Altima better, then please stop by and see us at our dealership, or take a look at our 2019 Nissan Altima Online Inventory!